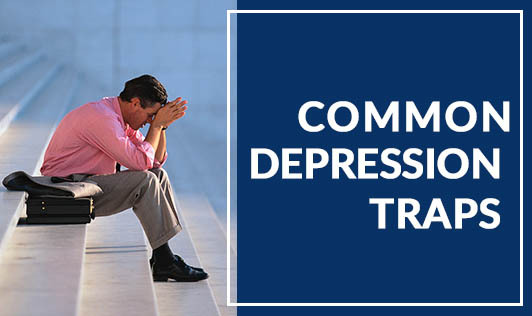 Depression traps vary from person to person, but what they have in common is that they serve to worsen one's mood, perpetuating a vicious cycle. There is nothing wrong in taking time out during difficult times. Whether it's the loss of a job opportunity, loved one or anything else that you've cared deeply about, the emptiness results in sadness. Everyone will experience it at one time or another. What's more important is that you should be able to acknowledge and experience emotions of sadness, but if you continue behaving the same way for too long, a tough time can turn into a clinical depression that is hard to shake. Denying your feelings: Trying to pretend that everything is okay, can be stressful and energy draining. One should acknowledge his feelings and accept that it is okay to feel that way and give a chance to experience the emotions at hand. Talk to a loved one or someone you trust. Sometimes, just telling someone how you feel is a great step in acknowledging that it's real- instead of always putting on a brave face! Isolation: Most people have the tendency to withdraw socially and spend more time alone when stressed. Brief periods for contemplation and crying are part of the process. However, extended periods of isolation will not help one heal. Research has shown that depressed individuals who maintain social relationships during difficult times recover sooner and experience less chances of recurrence. Ignoring your health: It's easy to stint on sleep, skip the gym, forget to eat when you don't feel like yourself. At this time, maintaining healthy habits should remain a priority. Take a day or two off from your normal routine if you really need to just to get back to it as soon as possible. Exercise, good nutrition and sleep will help you bounce back! Feeling guilty during moments of happiness: In deepest moments of sadness, you can still experience moments of joy and that is ok. If you find yourself laughing out loud or realising that you just had fun- embrace it. This doesn't mean that you care less or suddenly over the issue. It only means that you had a brief interval from feeling down. Self medicating with junk food, sleeping pills and illicit drugs: Although these offer immediate relief, these habits always lead to bigger problems. Experience and research suggest that with time, most people return to their happiness set point despite life's greatest losses. When that happens, you obviously don't want to find yourself with 15 extra pounds or a dependency problem to vie with. If you're self-medicating, talk to your doctor for safe and effective options to help you through this difficult time. Avoiding professional help: If time is passing and your pain is not, medical attention may be needed. If you notice that you can't sleep or sleeping excessively, have a loss of appetite or compulsively over eating, have difficulty attending to responsibilities, lost interest in activities that you once enjoyed and you can't get yourself to try any of the suggestions given above, it's time to see a doctor!